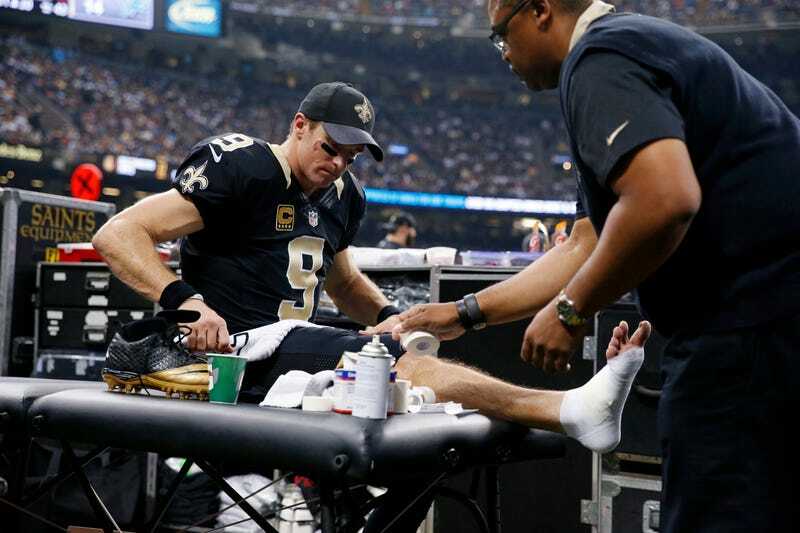 ESPN reports that Saints quarterback Drew Brees suffered a torn plantar fascia in his right foot during Monday’s 35-27 loss to the Lions. Sean Payton says he’s day-to-day, and Brees reportedly wants to play in the final two games of the year, but that would be stupid. Ed Werder says the injury came in the second quarter, as Brees stepped awkwardly while trying to avoid pressure. He looked hobbled later in the game, and appeared in a walking boot for his postgame press conference. The Saints don’t practice until tomorrow, so they won’t know until then if Brees can still go. Head coach Sean Payton is still talking as if that’s a possibility. Players can play, and have played, through partial tears like this—it depends on the severity and on their pain tolerance. But it’s an especially big deal for a quarterback; Brees pushes off that right foot, and will struggle getting as much on his throws. It’s the same injury that’s kept Peyton Manning out for more than a month. There’s no reason to risk any further injury, not with the Saints having nothing left to play for (save a better draft position). Brees has quietly had a pretty darn good year, even if he’s not up among the league’s very best anymore. But he’s turning 37 next month, and there are a limited number of quality games left in him. The Saints shouldn’t waste two of them.